WORRY LESS AZO Bladder Control with Go-Less helps reduce occasional bladder leakage from laughing, coughing, sneezing, exercise. AZO Bladder Control does what pads and liners can't do: helps support bladder muscle strength and allows you to feel more confident to laugh without worry! Frustrated with how often you feel the urge to go to the bathroom? Tired of waking up in the middle of the night? There’s a better way. 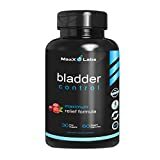 AZO Bladder Control with Go-Less is a safe, drug-free supplement that helps reduce the urge and supports bladder strength. This naturally-sourced blend will help you go less and worry less both day and night. 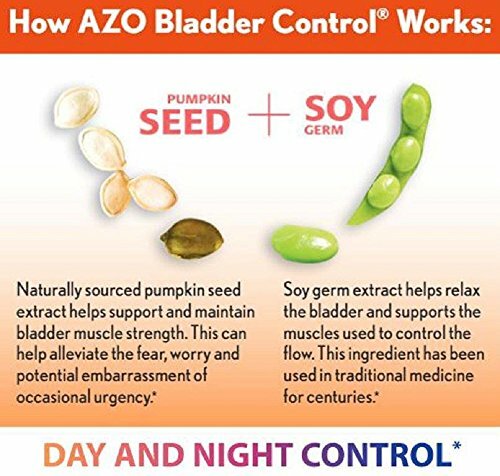 AZO Bladder Control is derived from a naturally-sourced blend of pumpkin seed extract and soy germ. Pumpkin seed extract helps support bladder control by toning the muscles and maintaining the strength of the detrusor and sphincter muscles to promote normal function. Soy germ supports healthy control by sustaining the bladder muscle and pelvic floor. You may experience bladder health benefits in as little as two weeks, however your body may respond faster or slower, so give it up to 6 weeks to realize the full benefits.